Partners can use the Arecont Vision Pixel Density and Field of View Calculator to derive the perfect Arecont Vision megapixel surveillance solution for clients' security needs. The Arecont Vision Pixel Density and Field of View Calculator is designed to help clients narrow the wide range of Arecont Vision products to find a solution that fits their specifications and needs. Simply input the details of the area the client wants secured and select their megapixel camera specifications. 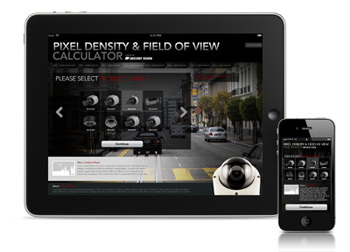 The Pixel Density and Field of View Calculator will determine the optimal solution to fit your client's requirements. You can even push these results from the Pixel Density and Field of View Calculator to the Arecont Vision Bandwidth Calculator to complete your client's Arecont Vision solution. Take the Arecont Vision Pixel Density and Field of View Calculator on the go to help clients anywhere find an Arecont Vision solution. The Arecont Vision Pixel Density and Field of View Calculator App for iPhone and iPad is available free on the Apple iTunes App Store.